“When you call yourself an Indian or a Muslim or a Christian or a European, or anything else, you are being violent. Do you see why it is violent? Because you are separating yourself from the rest of mankind. When you separate yourself by belief, by nationality, by tradition, it breeds violence. « Lorsque vous vous dites Indien, Musulman, Chrétien, Européen ou autre chose, vous êtes violents. Savez-vous pourquoi ? C’est parce que vous vous séparez du reste de l’humanité, et cette séparation due à vos croyances, à votre nationalité, à vos traditions, engendre la violence. This entry was posted in Authors, Quotes on consciousness and tagged Light, Love, overcoming barriers, peace, understanding. Bookmark the permalink. Brilliant. 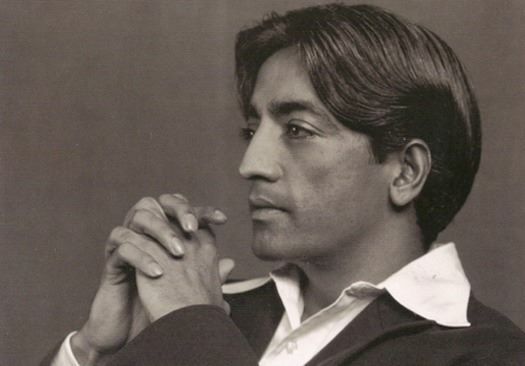 Love Krishnamurti’s stuff. I remember reading somewhere that he was once believed to be an incarnation of Maitreya Buddha, but there was some controversy over that and the claim was retracted. By whatever name he was one of the great enlightened figures.